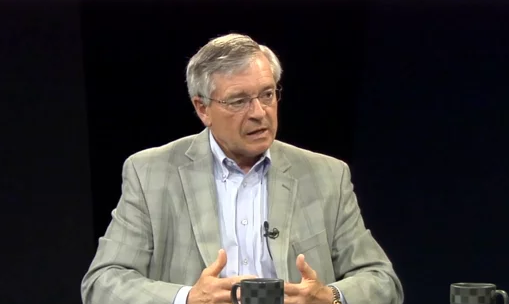 Monday night at 5:00 p.m., Mayor Heartwell answered questions from local citizens on GRTV Channel 25 and livestreamed on The Rapidian. City Connection - June 2015 from GRTV on Vimeo. This month, Kayla Tucker, The Rapidian's new city government and politics intern, asked for the mayor's advice on what specific topics and information she should cover to best help local citizens get ready to vote in upcoming primary and general elections. On Monday, June 1 at 5:00 p.m. the mayor responded to Tucker's question. He also answered questions about new storm drains, fiber communication and road upgrades in the city; a new ordinance allowing skateboarding in the city; the end of Clear Wireless alternative internet in Grand Rapids and a proposed single-card system for all public transportation and parking. Each month, you can add your own questions each month by calling in, emailing, tweeting or just posting a question in the comments section at the bottom of the article page. The show is aired on the first Monday of each month on GRTV, Channel 24 on Comcast, as well as live-streaming right here on The Rapidian.